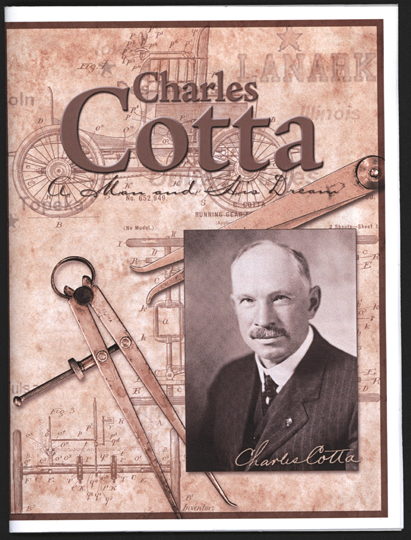 This biography of Charles Cotta was produced for Charles Cotta Day, June 28, 2014 in Lanark, IL. It contains an immense amount of material on the Cotta Steam Car as well as Cotta's life and other interests. In appearance the Cotta was similar to many other light steam cars of the period, but it was the only one to feature 4-wheel drive and steering. The 6 hp 2-cylinder engine was mounted exactly in the center of the chassis and power was transmitted to all four wheels by compensating chain gear. Georgano, G. N., Encyclopedia of American Automobile, (New York, E. P. Dutton & Co., 1968), p. 51.